Here is another Idiom of the Day video from the fabulous Richard Ford. 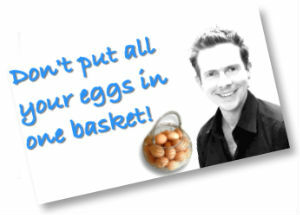 Today, Richard discusses the common English expression, don’t put all your eggs in one basket. Don’t put all of your opportunities and chances into one thing. For example: Don’t apply to (just) one job because you may not get it. Apply to many jobs and then there will be more chance that you will succeed. So don’t put all your eggs in one basket means: spread out your choices; keep your options open; don’t rely only on one thing. This is a good recipe for life. Thank you. This expression comes from the notion that if you gather all of the eggs that your chickens have laid into one basket (or container), and you drop it, you will break and therefore lose all your eggs. Place your eggs into several different baskets (or containers) and you will still have some eggs left even if you do drop one. You should diversify your investments and not put all of your money into just one company. If you put all your eggs in one basket you risk losing everything! Please ‘Like’ and share this post using the tabs on the left <==========.